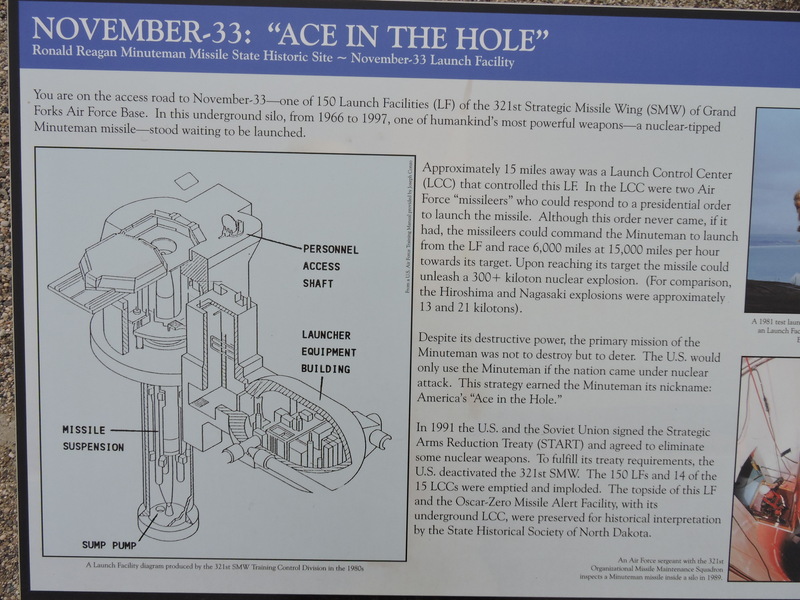 While driving across North Dakota, we saw a sign for the November-33 Minuteman Missile Site. The Ronald Reagan Minuteman Missile State Historic Site near Cooperstown, Idaho reminds us of Cold War threats and fears. November-33, was one of 150 sites that housed nuclear tipped missiles each roughly 14 times more destructive than the bomb detonated at Hiroshima. For those too young to remember, we had a strategy called MAD [I am not making that up.]. MAD stood for “mutually assured destruction.” It meant both the Soviet Union and the United States had sufficient nuclear weapons that if either was attacked, both would be completely destroyed — probably along with the rest of humanity. Blast door from the top with maintenance access hatch to the front. 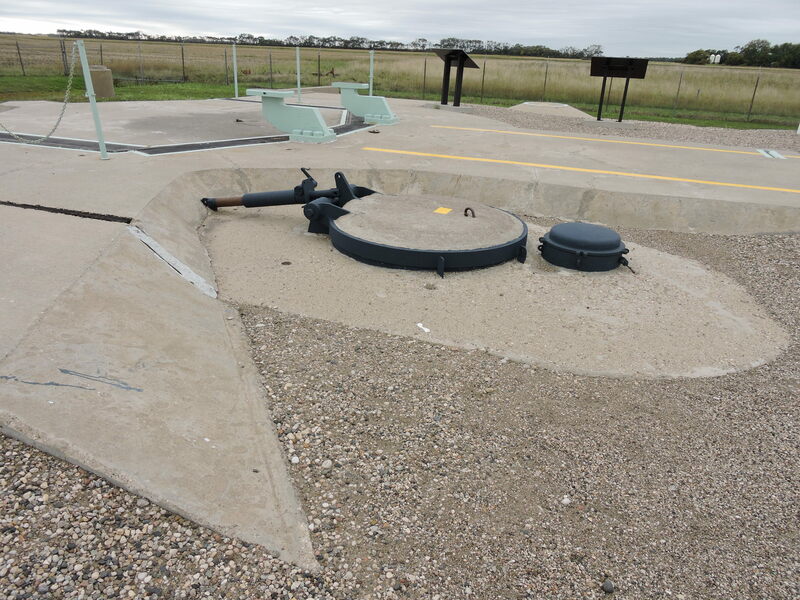 At November-33, we saw the topside of a launch facility, the massive blast door created to protect the missile in the event of an attack, the original 8-foot security fence, electronic security system and ventilation system. There isn’t much to see, but the signs describing how it all worked were very interesting. A few miles away is the launch control support building which had an eight-person security and maintenance team. There is access to an underground launch control center with two people responsible for monitoring and launching 10 of the 150 missiles belonging to the Air Force’s 321st Missile Wing. After President Ronald Reagan was elected, he simultaneously began dramatically increasing U.S. weapons while reaching out to Soviet Premier Mikhail Gorbachev who realized the Soviet economy could not keep up the arms race. That began a process which led to the 1991 signing of the START treaty limiting the number of strategic weapons on both sides. At launch, the blast door would be thrust back on these rail tracks. That treaty eventually resulted in the removal of these Minuteman missiles and the closing of the 321st Wing. 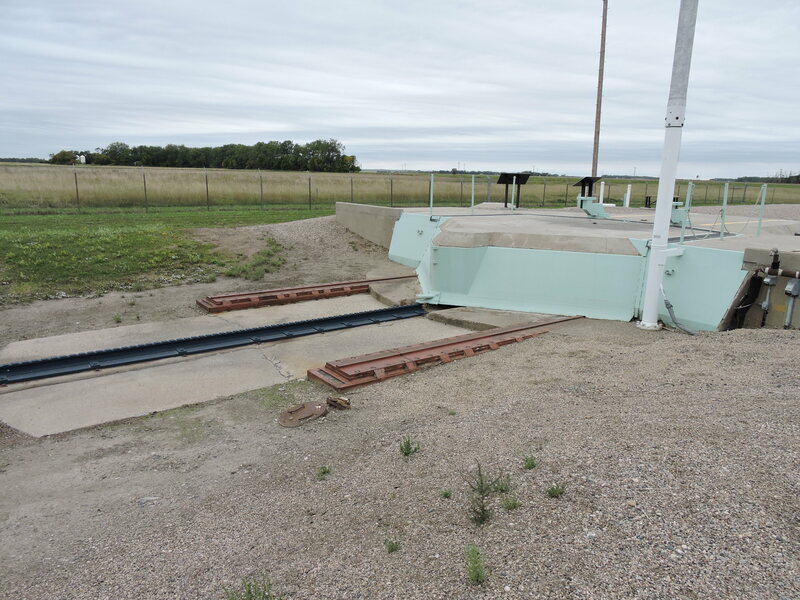 Each launch facility and control facility [along with those in South Dakota and Missouri] was destroyed except for November-33 and its control facility Oscar-Zero MAF which were preserved by the state of North Dakota and opened to the public. The Oscar-Zero tour was not available the day we visited. On days that it is open, guests are able to take the elevator down to the launch control center. We don’t read about MAD anymore. But it still exists. Three Minuteman sites each with 150 missiles are still operating on U.S. Air Force bases in the west. I hope that even though both President Obama and President Trump accused Russian President Putin of violating START by increasing Russian forces, both Putin and Trump have the sense not to start a nuclear war. That is what makes North Korea so scary. This entry was posted in Travel Logs and tagged MAD, Mikhail Gorbachev, Mutually Assured Destruction, Nuclear war, Nuclear weapons, Ronald Reagan, START, Travel. Bookmark the permalink. A stark and salutary reminder of my youth, but also morbidly fascinating. Too bad you couldn’t take the tour but still interesting! Quite a bit of history that I was only slightly aware of. Makes you wonder what our future holds for our country the way things are. Once again, thanks for the history lesson. Love to you both. I understand there are missile silos you can tour – if you don’t mind strapping on SCUBA gear. It’s not something I plan on putting on my bucket list. Yours was a fascinating tour with a surprising finish. Although I worry about the current leadership in both countries, my real concern is that nuclear proliferation will ultimately mean the weapons are in the hands of some zealot who just doesn’t care. A troubling reminder that we have not learned from our past mistakes.